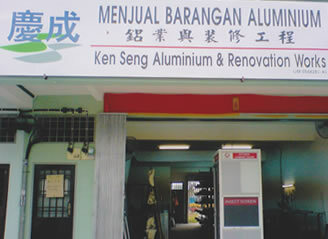 Ken Seng Aluminium & Renovation Works specialized in Architectural Aluminium and Glass Products offering consultation services with respect to design, fabrication, installation and project management for Commercial building, Residential, Industrial building and etc. Our factory is fully equipped with the latest and the most technological advanced Aluminum, Glass and Steel machinery, safety of both works and materials is our first priority hence all the works are provided with adequate working gears e.g. overalls, gloves and helmet for their protection and avoid damaging the materials while handling them. Our customers are able to take advantage of the expertise and experience of the Company, by associating us with the project at the Project conceptions and design stages, so that our advices can be incorporated in the project. This helps our Customers optimize the space, make greater use of natural lighting, achieve a higher level of architectural beauty, while providing privacy, exclusiveness, noise reduction and energy efficiency.